Caspian Offshore Construction (COC) is a world-class marine company, supporting oil and gas (O&G) offshore exploration, development and production activities for more than ten years. Core services include offshore safety standby, firefighting, supply, ice breaking and ice management, towing, offshore accommodation, waste management, crew transportation, oil spill response, diving, marine vessel management, vessel maintenance and repair, and new build construction project management and supervision. COC presently owns an expanding fleet of 19 vessels and five oil spill response vessels and manages a further 23 vessels on behalf of our clients, all of which are engaged in major offshore project support activities. COC’s offshore support fleet includes two floating hotels, five ice-breaking tugs, two multipurpose anchor handling tugs, two survey vessels, three fast crew boats, and five multipurpose, shallow draft, ice-classed 50t bollard pull tugs. COC owns five multipurpose, 50t bollard pull, ice-breaking tugs are designed and constructed for shallow water icebreaking operations utilising COC, STX, and Aker Arctic Technology. During the last five years, these vessels have proved themselves ideal for severe climates, with temperatures ranging from -35°C to 40°C, ice up to 1m thick, and the very shallow waters found in the North Caspian Sea. COC performs a wide range of operations, including offshore safety standby, firefighting, supply, ice breaking and management, towing, offshore Accommodation, waste management, crew transportation. The company can also accommodate survivors in accordance with UKOA120B regulations. COC’s Ice Class emergency response rescue vessel (ERRV) allows the company’s fleet to evacuate up to 300 people from offshore facilities in an emergency situation, such as an H2S release in both open water and ice conditions. The Mangistau 1,2,3,4 and 5 vessels have been fitted with an overpressure ventilation system capable of three operational modes. Mangistau 4 and 5 have been further upgraded for NUI operations, acting as the primary means of escape for island maintenance personnel. In addition, all Mangistau vessels have firefighting (FI-FI) 1 notation. COC maintains the highest international standards for health, safety and environmental protection, exceeding O&G standards in many areas. A modern fleet and highly skilled and qualified staff has allowed COC to implement an industry leading safety management system and obtain certification in accordance with the International Navigation Safety Management (ISM), quality and environmental management system, based on ISO 9001: 2008 and ISO 14001: 2004 standards. COC has also received a number of safety awards from our O&G major clients, including awards for lost time injury (LTI) free operations exceeding five million hours. Since 2012, COC has been licensed to respond to offshore and onshore emergency oil spills using our fleet of five ultra-shallow draft crafts and a full suite of containment and clean up equipment. COC has an in-house diving division, based in Bautino, Kazakhstan, which is certified by classification societies such as Bureau Veritas, ABS, RINA and Russian Maritime Register of Shipping (RMRS), which provides year-round diving services. COC is actively engaged in the development of local marine crews. Currently 58% of more than 516 mariners are represented by Kazakh nationals. Partner personnel agencies are only used to source and pre-screen potential candidates for vacant positions, as the company grows, whereas all mariners are direct staff employees. Using the company’s experience, high levels of technological knowhow, coordinated teamwork, and the ability to undertake a wide range of objectives, COC continues to move forward and remain both commercially and technically attractive over our competitors in the Caspian market, both domestic and foreign. A 100% private Kazakhstani entity, COC began its operational activities in early 2005 with the purchase of two floating hotels, Shkotov and Caspian Princess, for marine personnel and on-site workers accommodation. COC offices are located in Almaty, Aktau, Bautino, (Kazakhstan), Astrakhan (Russian Federation), Ashgabad, Turkmenbashi (Turkmenistan).COC provides services to a number of major international O&G companies such as NCOC (ENI, Shell, Exxon Mobil, Total, Chines National Offshore Oil Corporation, Inpex and KazMunaiGas) Saipem Kazakhstan, Saipem Astrakhan Branch, Ersai Caspian Contractor, Lukoil, Bumi Armada, Fugro, Van Oord and Dragon Oil. COC currently owns 19 vessels (the majority of which were built in leading European shipyards), and operate more than 40 crafts, which accounts for more than a third of the Kazakhstan offshore market today. 8-9 June 2016 saw the fifth 'Yamal Oil and Gas' international forum take place in Salekhard, Russia. The Caspian Offshore Construction representative gave a short presentation about the company and about the maintenance services in the area of oil fields in the rough conditions of the North Caspian Sea. Established 2003, Caspian Offshore Construction LLP (COC), 100% private Kazakhstani entity, is a leading provider of marine offshore support fleet operation and management services in the Caspian Sea. 39 building, ‘Zodiak’ business-center, 17 mcr. On 1-4 June 2016, Baku hosted the 23rd Azerbaijani International exhibition and conference CASPIAN OIL & GAS 2016. This is the third year in a row when Caspian Offshore Construction has been taking part in the great event of the energy sector in the Caspian area. 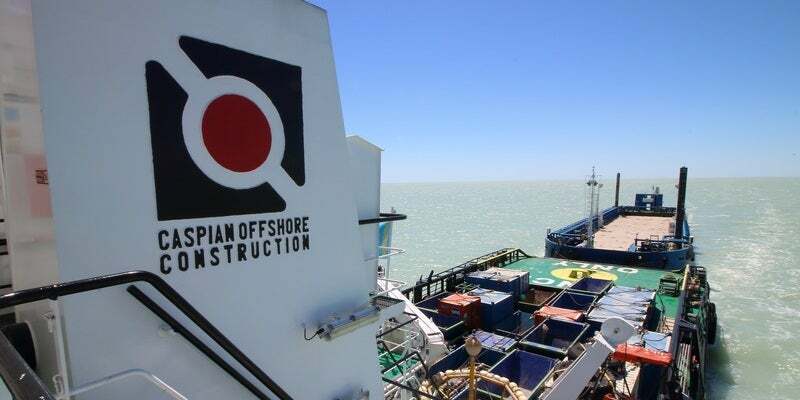 In the 13 years of its operation, Caspian Offshore Construction (COC) has taken about a quarter of the Kazakhstan industrial infrastructural navigation market in the number of vessels and approximately a third of the Kazakhstan market of maritime services of oil operations services in the volume of sales.